Cheers, high fives, a pep band, a performance from the dance team, and a gymnasium filled with people who are passionate about education — that is how teachers and staff were welcomed into the 2018-19 school year. On Tuesday, Aug. 28, District staff gathered for the annual District Kickoff event. They entered the Lindbergh Center through tunnels of enthusiastic students cheering and handing out high fives. 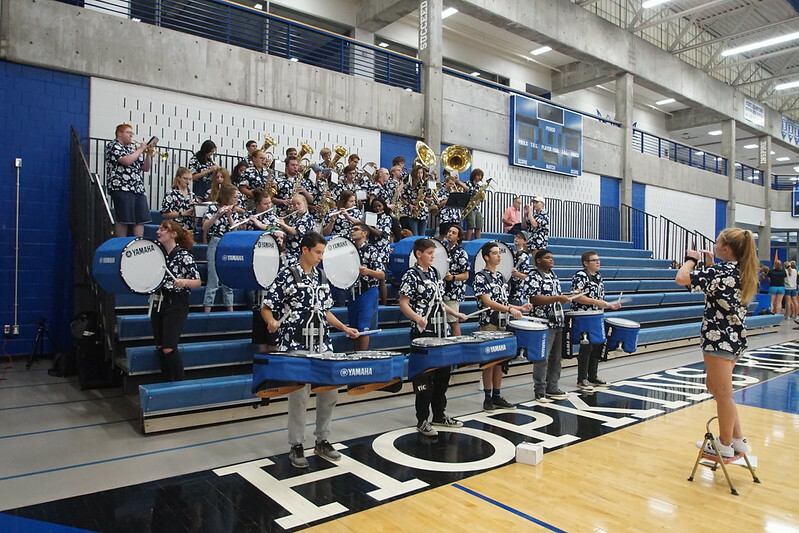 The Hopkins pep band, the Lean Mean Performance Machine (LMPM), played music that energized the crowd. Dr. Rhoda Mhiripiri-Reed welcomed District staff and gave a brief overview of what progress has been made and what is to come as we continue our efforts to move our education system from Great to World Class. “With everyone’s voices, we will articulate a collective vision of great to world class,” she said. Mhiripiri-Reed introduced the Royal Reps, a group of students who spent the summer out and about in the community collecting information from community members about what World Class learning looks like to them. The Royal Reps said they surveyed about 298 people. The survey answers offered valuable insight of what the District is doing right and what can be done better at Hopkins. The morning continued with two presentations. Keynote speaker Jenni Donohoo talked about the power of teamwork and collective efficacy, and a group of District staff and students delivered a presentation outlining Hopkins 2031 vision. The morning culminated with the annual picnic, which has a new theme every year. This year’s menu consisted of Somali cuisine. The afternoon consisted of teachers and staff traveling to their specific site for a debrief from their principal. Excitement for the 2018-19 school year was obvious throughout the day. We hope to see that same energy flow into the first day of school when students return next week!